A pimple on the nose area is often the highlight of the face. This one feature on the face can allow a small set of pimples to stand out prominently. It never fails that these develop when there is an important event occurring, either. If you are dealing with a red dot on your nose, it pays to know how to get rid of it properly. The problem is, though, many times people believe common myths about acne and they do not employ the proper treatment to get rid of the ugly looking red dot. You do not have to suffer from this condition, though. If you have the development of acne in this area of the face, the good news is that it is common. The nose is a hotbed for bacteria. The skin here tends to have more oil than other areas of the face. it also is a prominent area for suffering from wind damage or exposure. As a result, there are often a large number of skin cells discarded from the area. This, plus the easy access to bacteria creates the perfect assortment of environmental factors for pimple creation. If you develop a pimple on the nose, do something about it. However, do avoid these common myths. 1 - Pop it - it is the fastest way to get rid of it. That is not true. In fact, it may reduce the redness initially but it also spreads the bacteria to the surrounding tissue, therefore increasing the number of pimples you will have. 2 - Do not do anything - you could damage the skin for good. Though acne can leave scars, doing nothing about the pimples is not the right solution. Rather, use mild soap and exfoliation to help cleanse the area properly, removing the oil and dead skin cells from the mix. 3 - A pimple here means cold sores - That is not the truth either. Cold sores commonly occur on the area surrounding the lips and on the lips themselves, not the nose. If you develop a pimple here and it is large enough or broken open enough to resemble that of a cold sore, you may need treatment that is more extensive. Do not avoid it. Rather than deal with the pimple, it is often best to take the next step and just to get rid of it through proper care. There are over the counter treatment options available that can help to reduce the redness and help to heal the inflamed tissues quickly. The key here is to use them as soon as possible. You will want to dry out the pimple properly, without breaking it open. You can do this with many over the counter products. 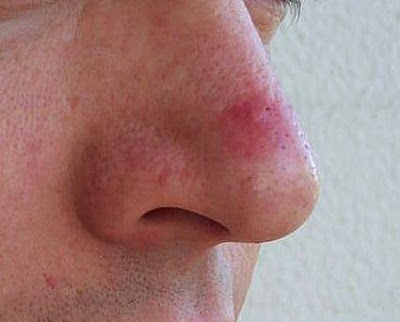 A pimple on the nose is common, but it does not have to ruin your complexion. Rather, it should be an opportunity for you to improve the overall health of your skin through improved care. Taking care of your skin can reduce the risk of developing more acne in this area.